We are excited to announce Zoe our founder has been shortlisted for the 2018 complementary therapies awards for the impact T4F has on the mental health and wellbeing of the service users. The shortlist reflects the hard work of all the volunteers since 2011 to make a positive difference in the lives of injured veterans and their families. From 1-2-1 appointments to the populat relaxation and wellbeing event which are now in their 7th year. They are run throughout the UK at various locations. 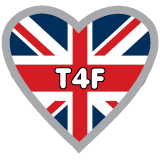 If you would like to volunteer for T4F please let us know. If you would like to know how to access our services the quickest way to contact us is via our Therapies4Forces Facebook page by sending a private message.